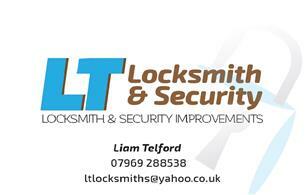 L T Locksmith & Security - Carpenter, Locksmith based in Ingleton, Lancashire. At LT Locksmiths I am a local, reliable and trustworthy locksmith company based in the North West offering professional and competitively priced domestic, commercial and automotive locksmith services throughout North Yorkshire, Cumbria and Lancashire. I am on call 24/7 for Emergency assistance and do not charge a call out fee. A family run company with no call center, when you contact me you will speak to the me the locksmith where I will be able to give you an accurate quote and time scale of the work requested.